Two points dropped for Liverpool? That's the end of another busy day in the Premier League. How important will the draw at Goodison Park be at the end of the season? Liverpool manager Jurgen Klopp tells Sky Sports: "It is OK, a difficult game for different reasons and a wild opponent. The wind was coming from all directions and did not help anybody. It was a game that was difficult to control and we had three or four really big chances with Mohamed Salah and Fabinho, I don't remember them having any chances. It is 0-0 and we kept our unbeaten run against them, not exactly what we wanted but it was a difficult game. "Salah is doing everything right up until the last second, we had our moments and we have to fight the circumstances and the opposition, the boys did that. Our derbies are over and we play all the others now. It was not a genius game but we got a point against an opponent who is double motivated. "We have to take the sitauton as it is. We talk about a free-flowing Liverpool side the other day and now we have Burnley at Anfield. Only 400 yards away from here but a completely different game. We have to show stability and fight for the result." Clearly it is not a good point. They had chances to win the game, Mo Salah didn't have his shooting boots on and it is two points dropped. Liverpool defender Andy Robertson, speaking to MOTD: "We become the chasers now and all the pressure is on Manchester City. Liverpool are only a point behind, it remains a very close title race. But Liverpool were seven points clear not so long ago. Liverpool manager Jurgen Klopp tells BBC Sport: "I already know what the pundits will say in the studio - situations like today you have to finish it off. "But to be successful in football you have to be stable and we were the better side today. The wind does not help and there was a lot today. You have to be ready for the fight of the second ball. We had five or six big chances but Jordan Pickford or a defender was in between. I don't think they had a real chance. Not perfect but good enough, getting a point from Everton is always a success because it is our most difficult away game of the season. "You need stability but it was a difficult game. I did not want to throw Naby Keita in to deal with these difficult circumstances. We brought Adam Lallana in but all the football plans, throw them in the bin because you have to be ready for the long balls and the second balls. We defended the set-pieces well, we caused them a few problems but unfortunately we did not finish them off. "I’m completely fine with chasing. Who wants to be top of the table at the beginning of March? It is nice but there are lots of games to play. I watched Match of the Day last night and saw the celebrations of Man City, they had 900 chances and scored one goal, a shot with the wrong foot. You have to be ready for these chances." 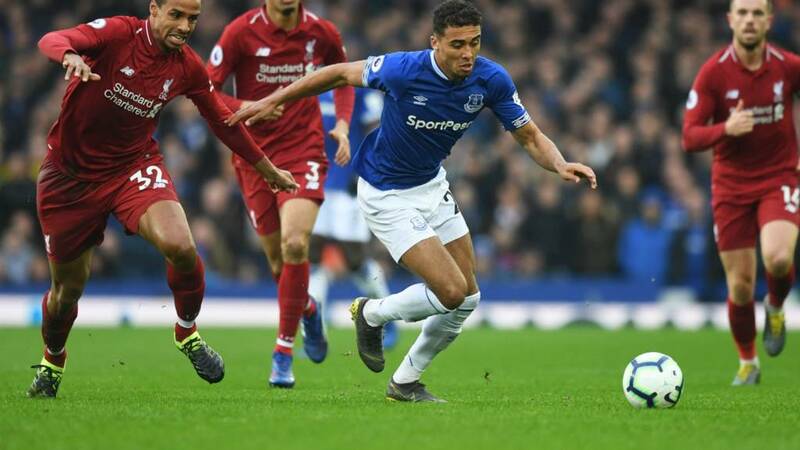 Everton boss Marco Silva, speaking to MOTD: "I'm proud of my players and the desire they showed. "It felt amazing in our stadium. Our fans were amazing and they pushed the team from the first minute. It was a tough match but a balanced match." On the rest of the season: "I told them before the Cardiff game that every match has to be a final for us. There are many games to play and many points to win before the end of the season. Nothing is finished for us." More from Jurgen Klopp to Sky: "My Mrs was not in today so my heart was with the supporters. I know how important it is for them and they appreciate how hard the boys fought. We fight together and then in the end we will see where it leads us. "Sadio Mane played one of his best games ever the other day and Firmino looked fine. Mo Salah needs to stay on track and work for the moments and situations. "We do not think about City when they are a point behind us, now we are behind them but not too far. They have to win, we have to win and let's see who wins more at the end." For the first time in my life I agree with Chris Sutton! I will pray for forgiveness after 606. It's the supporters who are panicking not the team! Even if we were to finish 2nd, we will NOT, it would still be a successful season. Relax and enjoy the journey. Everton are in the battle to be the best of the rest, today's point leaves them midtable. Everton keeper Jordan Pickford, speaking to MOTD: "We worked hard as a team and had a duty to our fans. We knew how much this fixture means to the fans. If you can't score then don't concede. "We have got nine games left and hopefully this is the start where we can build some momentum into the side." Everton boss Marco Silva tells Sky Sports: "A tough match for both teams. The atmosphere in the stadium was fantastic. If you can repeat this then I am 100% sure that 20-30% our job is done. I know it is special match. Both teams wanted to win, they had a chance in the first half when we lost a ball through a mistake. Both teams had dangerous crosses but we were the better team in the second half. "The fans can push our team to win, not just this game but any game. They were the 12th player on the pitch and I expect 80% of that in the next game here. "We pressed more high in the second half and our team improved with the fresh players. We played more in the middle but we had to be aware of their counter-attack. "What I wanted to give the fans was the three points but we gave them a good performance and desire. We showed a good attitude and they want to see that always." An over-reaction to the draw from Liverpool fans? "It is ridiculous to say Liverpool are bottling it. It is not down to mental fatigue that they are struggling. It is not over yet, there are nine games to go. "Liverpool fans are bottling it, not the players." Alex, come down to League Two with me if you want a frustrating side to support. You're a point off the top! Last silverware the reds won was 2012, lost 3 finals since then, and now we throw the most important game in a supporter's season. Such a frustrating team to support.